I am not much of a gardener (really, I'm not), but I do have a few pretty flowers in my yard. This hardy plant with yellow flowers graces my property every summer. I think it may be coreopsis, but I'm not sure. Maybe our readers can enlighten me. Visitors to Ocracoke Island sometimes ask if the Outer Banks rests on an underlying bed of rock. No, it is sand, and more sand, for quite a ways down. However, now and then you will see rocks scattered about in the village -- lining flower beds, made into low rock walls, and just randomly lying about in yards. You might wonder where they came from. Most of the rocks on Ocracoke came from 18th & 19th century sailing ships. They were used as ballast on vessels from England or from other colonies that came through Ocracoke Inlet. Before loading their holds with North Carolina goods the crews cast the ballast stones overboard, or tossed them onto the shore. Yesterday I wrote about James Barrie Gaskill and his "Fat Boys Fish Company." 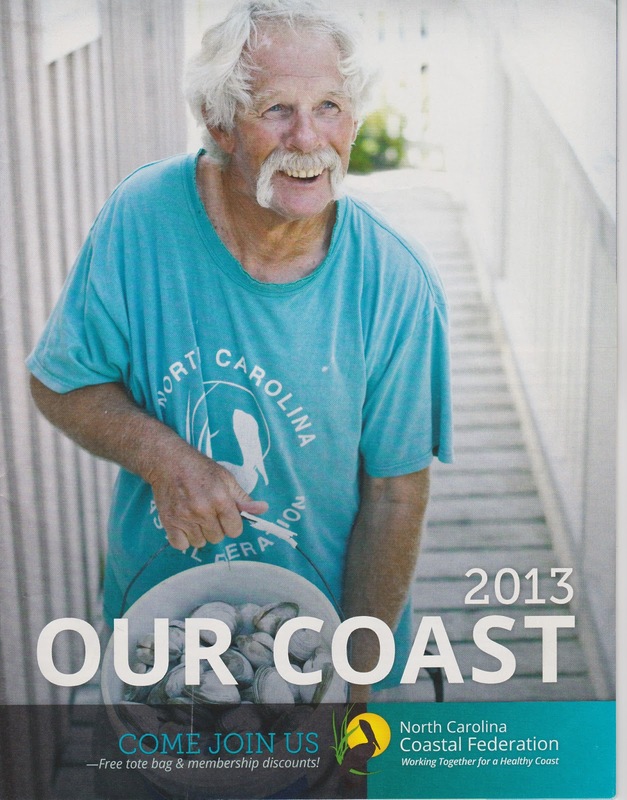 James Barrie is not only an Ocracoke fisherman...he is also a board member of the North Carolina Coastal Federation. He was featured on the cover of their most recent magazine. James Barrie is pictured above with a bucket full of tasty Pamlico Sound clams. Be sure to stop by his truck stand for some fresh seafood when you are on the island! Just about every day in the season James Barrie Gaskill (simply "James Barrie" to most) has his Fat Boys Seafood truck parked beside Albert Styron's store from 3:00 - 6:30 pm. There you can purchase fresh shrimp, clams, and crabs. Pictured above are James Barrie picking shrimp from his cooler, his son Morty standing in the truck bed, and one of many satisfied customers. Stop by Fat Boy's Seafood Truck for fresh Pamlico Sound shellfish. 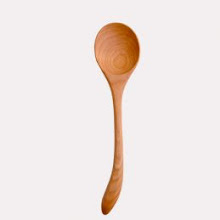 It can't be beat! I was reading Voltaire's Candide the other day, and I came across this sentence about a terrible storm at sea, during which Candide's companion Jacques was washed overboard: "[Candide] tried to throw himself after [Jacques] into the sea; he was prevented by the philosopher Pangloss, who proved to him that the Lisbon roads had been expressly created for the Anabaptist to be drowned in them." And I wondered how many folks who do not live near the sea know what "roads" means. Roads, or roadstead, is a partly sheltered body of water near the shore where ships may safely ride at anchor. The nearby coastal area of Virginia, Hampton Roads, is a reference to this same nautical term. According to the newspaper, The Virginian-Pilot, "[m]ost sources say the name Hampton Roads originated with the Third Earl of Southampton, Henry Wriothesley, a wealthy English nobleman from the southern port city of Southampton, England. (And a close friend of William Shakespeare.)... [And] roads comes from the centuries-old nautical terms 'road' and 'roadstead....'"
Steam Ship Cragside, -- Home port -- London England. 4 years old, 2 masts, Master, W.L. Sinclair, traveling from Galveston, Texas to Liverpool, England -- Crew 23 -- cargo, cotton.... wrecked near Ocracoke LSS, 7 pm at night, moderate winds, thick fog, high water, sea moderate.... Arrived at wreck at 11:30 pm, returned to station 5 am.... 2 trips with surf boat... Breeches Buoy used -- 15 trips of breeches buoy to wreck.... 22 lives saved, English and Japanese. (1 life lost -- Ipswich, England) attempted to leave in ship's Boat and was capsized...."
Take a look at our Facebook page (link is on the right) for one more, spectacular photo. A small group of us went to the beach the last two nights, at sunset, to watch the moon rise. On Saturday night we arrived just as the last sliver of the moon retreated behind a layer of clouds. Even though it was overcast last night we went out again "just in case." We were rewarded with a spectacular sight. The huge, orange moon rose over the ocean, and cast its golden light upon us. Fortunately, one of our group, Abe, had his sophisticated camera...and knew how to use it. His photos were outstandingly beautiful, and he promised to send me one to share on our blog. Unfortunately, he had some Internet connection issues last night. I should get the photos later today...and I will post them as soon as I do. They are worth waiting for, so check back later today! 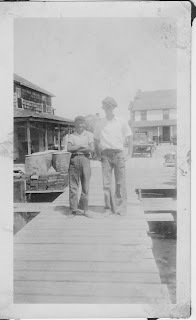 This photo was taken, probably in the early 1930s, at the old Pamlico Inn. The Inn, located on the sound shore almost due west of the lighthouse, catered to hunters, anglers, and summer visitors. Square dances were held in the building on the left. The Inn was destroyed in the 1944 hurricane. I found this picture recently in a box of vintage photographs that belonged to my father. I'm not certain, but I think the taller young man may be Thomas Gilbert Jackson, born ca. 1911, one of my father's best friends. I believe so because of the rakish angle of his hat! The Fourth of July Parade has been a staple of Ocracoke Independence Day Celebrations for many years, first in the 1950s, then again for the last 25 - 30 years. Our latest Ocracoke Newsletter is a photo gallery of various floats from years past. You can see the pictures here: http://www.villagecraftsmen.com/news062113.htm. Unfortunately, I don't know the last year of the early parades, nor do I know what year they were revived. If any of our readers know, please leave a comment. Also, I only have a limited number of photos. There were so very many other creative floats. Perhaps readers know of other photos that have been posted on Facebook or elsewhere on the Web. If so, please leave a comment. Many thanks...and enjoy the photos. Can any of our readers identify this flower? It is a volunteer that sprouted under one of my cedar trees. At first I thought it was a variation of the Joe Bell flower (http://www.villagecraftsmen.com/news012112.htm), but the leaves are different also. According to Ocracoke native, Cecil S. Bragg, author of Ocracoke Island: Pearl of the Outer Banks, the first diploma ever presented to an Ocracoke Island student was hand written on plain paper, and given to Robert Stanley Wahab (1888-1968). 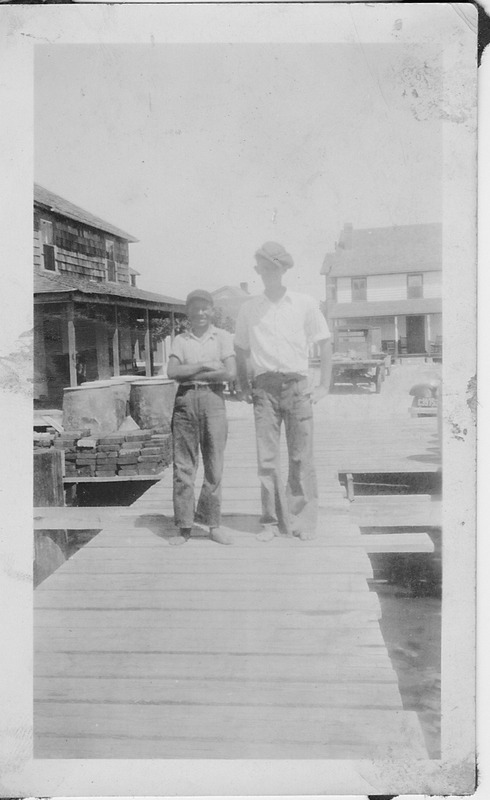 Stanley, as he was known, contributed much to the development of Ocracoke, including the installation of an ice plant and the construction of the Wahab Village Hotel (now Blackbeard's Lodge). The diploma read, "Ocracoke, N.C. Apr. 28, 1904 This is to certify that Mr. Stanley Wahab has studied the fundamental branches under me, spelling, arithmetic, and grammar, has acquired a sufficient knowledge of these to prepare him for the practical affairs of life. Yous truly, J.E. Redfern"
Island birds have been singing their melodies all spring. What sweet sounds! The other day a mockingbird on Howard Street was even mimicking the ring of a cell phone. This is what Pat Garber has to say in her book, Ocracoke Wild: "Among all the wondrous joys of springtime, probably my favorite is the chorus of birdsong that fills the air and the industrious activity that accompanies it. Male robins, house wrens, and warblers, newly arrived from their wintering grounds to the south, stake out territories with a variety of calls, whistles, and songs. Soon, as their potential mates arrive, they pair off and begin building nests. And what more thrilling sight exists than a newly leafed tree that wears, to quote Joyce Kilmer, "a nest of robins in its hair?" Ann Mariah Styron Bragg (1847-1917) is buried "Down Point" near the Soundfront Inn. Her marker reads "She hath done what she could." She and her husband, Capt. 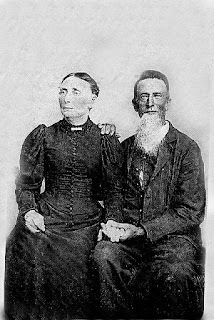 Samuel Dudley Bragg, Sr., had 7 children. In 1892 Samuel Dudley Bragg, Jr. (1870-1892) and his brother Maltby (1877-1892) were on the mainland, having just sold a catch of fish. As they were getting ready to sail back to Ocracoke the weather began deteriorating. They were advised not to attempt to cross the sound in such weather, but they insisted, saying they knew the waters and they would be OK. They cast off and were never heard from again. In 1902 a schooner captain brought his vessel to an Ocracoke anchorage because his ship was leaking. Not being able to make the repair, he left his vessel at Ocracoke under the care of Capt. Dudley Bragg, Sr. After Bragg finished the caulking a tug arrived to tow the schooner to Norfolk. Capt. Bragg and his son, James, accompanied the schooner. After rounding Cape Hatteras they encountered high winds and rough seas. The captain and crew of the tug feared that the heavy seas and strong wind would pull the bowsprit out of the schooner, so they decide to "cut her loose." The schooner disappeared in the storm and sank. "And the Sea gave up the Dead which was in it." Ann Mariah lost two sons in 1892, and another son and her husband in 1902. Her daughter, May Belle, had died in 1885 at 12 years old. Ann Mariah was left with one daughter, Isabella, a son, Hallas, and another son, Gary, who ran the Cedar Grove Inn [later named the Soundfront Inn; now a rental house]. What more could be said? Ann Mariah "hath done what she could." It's that time of year again -- clamming season. With just a clam rake, a floating basket, and access to prime spots in the shallow waters of Pamlico Sound an abundance of succulent hard clams or quahogs (Mercenaria mercenaria) can be harvested. My favorite way to prepare these delicacies is as "clams casino." Simply open the clam with a sharp knife (be careful --this is probably best left to someone experienced), add a dollop of white wine, top with a small strip of bacon and sprinkle with Parmesan cheese...and broil for about 15 minutes, until bacon is crisp. Serve on the half shell with saltine crackers and beer. 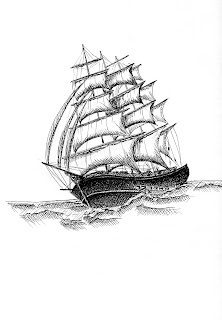 In honor of Ocracoke Island's seafaring traditions I share with you today a pen & ink sketch I made of a three-masted, square rigged sailing vessel. Many years ago dozens of ships like this one might be seen offshore, or anchored near Ocracoke. The only reason I mention the North Pond Hermit is that I don't know who the Kardashians are. I've heard their name (and that they raise eyebrows), but I don't know who they are, what they've done, or anything else about them. And I don't care, so please don't enlighten me. I am happy living in my Ocracoke Island cocoon, not a hermit, surrounded by family, friends, and a supportive community, but blissfully ignorant of much national and world gossip. To view a larger, more readable image in Internet Explorer do a right click on the image, then "Open Link in New Tab," then left click on that image to enlarge. Beautiful pink and white blossoms of Oleander (Nerium oleander) are gracing island yards this time of year. The ornamental Oleander shrub grows well on Ocracoke. But, beware! All parts of this plant are poisonous. I have heard of island dogs dying after chewing on Oleander branches. The story has even been told of a Boy Scout troop that died after using Oleander sticks to roast hot dogs. This is probably an urban legend (see http://www.snopes.com/horrors/poison/oleander.asp), but this attractive plant is, in fact, very toxic. Enjoy it, but do not eat it! In spite of the poor soil in my front yard (it was filled with dredge spoil when the Navy dredged the harbor during WWII) a passion vine winds around my porch railing and sprouts wildly exotic flowers throughout the summer. They are a wonder to behold, although they can sometimes be difficult to see, hiding among the leaves. from this world of pain. The visitor almost always wants to know if this Agnes Scott has any connection with the eponymous Agnes Scott College in Decatur, Georgia. 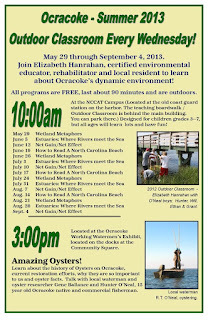 I had always heard that Ocracoke's Agnes Scott was the daughter or granddaughter of the college's namesake. Seeking more information, I wrote to the college. Their public relations office replied promptly, writing that "unfortunately your Agnes Scott may not be related to our college's namesake. It seems there are hundreds of Agnes Scott's throughout the country." With the help of islanders (quite a few native Ocracokers are descendants of Agnes Scott & Capt. Myron A. Garrish) and the Internet I finally discovered the full story. Col. George Washington Scott (1829-1903), Florida & Georgia businessman and son of Agnes Irvine Scott (b. 1799 in Ireland, d. 1877 in the US), founded the college which he named after his mother. His brother, Alfred M. Scott, confederate soldier, was the father of Ralph Booker Scott who was the father of Agnes Scott (great-granddaughter of Agnes Irvine Scott &wife of Capt. 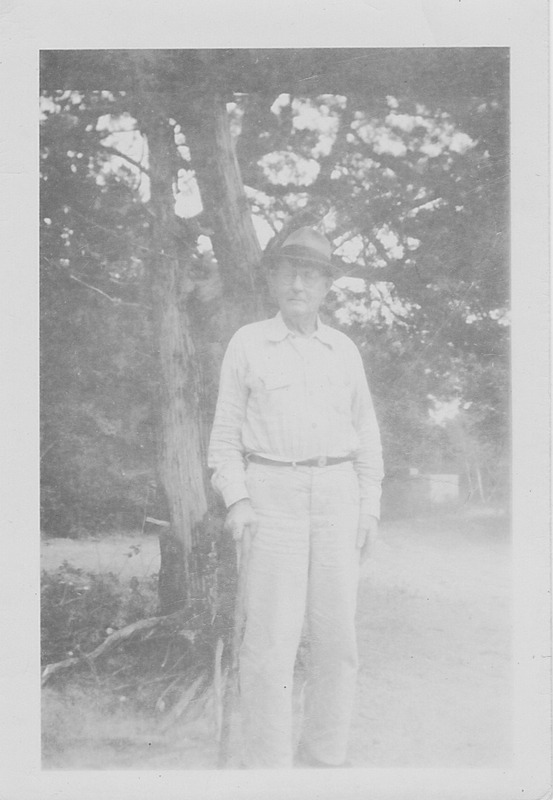 Myron A. Garrish of Ocracoke). Agnes and her sister Allie ("Teeny") somehow found their way to Ocracoke in the early decades of the 20th century, and Agnes married Capt. Myron A. Garrish. Agnes and Capt. 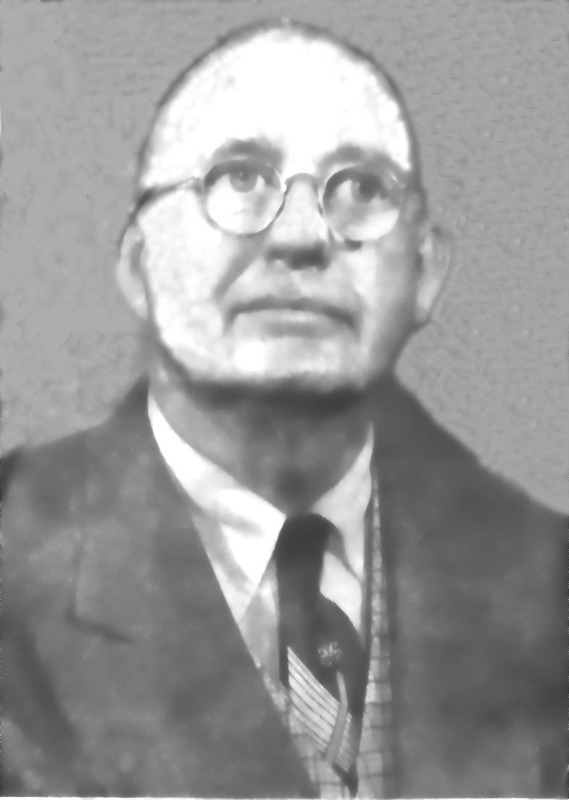 Garrish had two children, Irvine Scott Garrish, and Myron A.Garrish, Jr.
Irvine (often spelled Irvin) Garrish was Ocracoke's first County Commissioner. NC Highway 12 (Irvin Garrish Highway) is named for him. Other branches of the family (descendants of Teeny and another sister, Clare) also live on the island, including the owners of the Pony Island Motel, or visit here regularly. Every winter the trumpet vine that climbs on my fence looks dry and dead. But by early summer, it sprouts bright new green leaves, and sends shoots along the top of the fence. By June dazzling orange trumpet-shaped flowers blossom out to add color and variety to the corner of my yard. Not long ago I was standing in line behind a neighbor at the Variety Store and I noticed a tattoo on her upper arm. It was of a scantily clad young lady (the tattoo had wings, so I think it was a nymph or a fairy). I pointed to the tattoo and said, "That reminds me of the tattoos of naked ladies that my uncle had on his calves. When I was a kid he would roll up his pants legs, flex his muscles, and make the ladies dance for me." 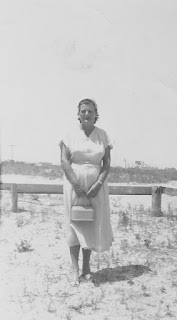 My neighbor told me that soon after she moved to Ocracoke with her father they decided to attend church. She expressed some concern about her tattoos and what the parishioners would think of her. Her father reminded her that this was a seaport village, and the natives were accustomed to tattoos. She was still a tad nervous, thinking her appearance might be a little too unusual...until she settled herself in the pew and glanced down to see that a native islander was sitting next to her barefooted. Today kicks off the 2013 OcraFolk Festival, a fun-filled, lively weekend extravaganza of music, storytelling, dance, art, and crafts. The Festival begins at 4 o'clock this afternoon with storytelling in Deepwater Theater, followed by a catered dinner at the Live Oak Stage. Dessert and art auction begin at 7 pm at Berkley Manor. The weather forecast, of course, calls for wind and rain today thanks to tropical storm Andrea, but it looks like conditions will improve tomorrow. On Saturday, stellar musicians and storytellers will be entertaining crowds at the Live Oak Stage, the Howard Street Stage, and other venues throughout the day. 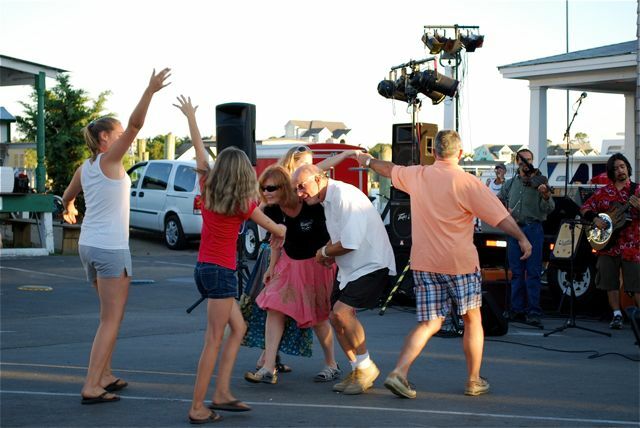 A traditional Ocracoke Island square dance will be held Saturday evening, followed by more outstanding music. Sunday's events include an old-time Gospel Sing and more music, including an all-star jam finale. There have been several changes this year, so be sure to take a look at the schedule here: http://www.ocrafolkfestival.org/ocrafolkfestivalschedule.cfm. For our readers' information, today marks Village Craftsmen's 3,000th blog post. This all started more than nine years ago, on March 3, 2004. We hope you enjoy reading about Ocracoke culture and traditions, learning tidbits of island history, reading announcements of local events, and seeing photographs of our village, our community, and our island.We enjoy sharing our island with you. And we hope you keep reading as we continue our blog. This evening at 6:30 islanders will gather on the lawn of "Books to be Red" for a party in honor of our very own UPS man, Grant MacDonald, who retired last week after approximately 30 years of service. Grant spent the majority of his time delivering packages to Ocracoke. In the process he learned nearly everyone on the island, and became friends with most. Grant's cheerful nature, easy smile, and buoyant spirit endeared him to business owners and residents alike. As testimony to his long connection to Ocracoke he and his wife decided to spend their first post-retirement vacation on the island. We are all looking forward to toasting Grant whose term of service will be remembered for many years to come. Congratulations, Grant, and may your retirement be happy and fulfilling! This photo of my mother, Kunigunde Guth Howard, was taken about 1955. I found it in the same box with the photo I shared yesterday. 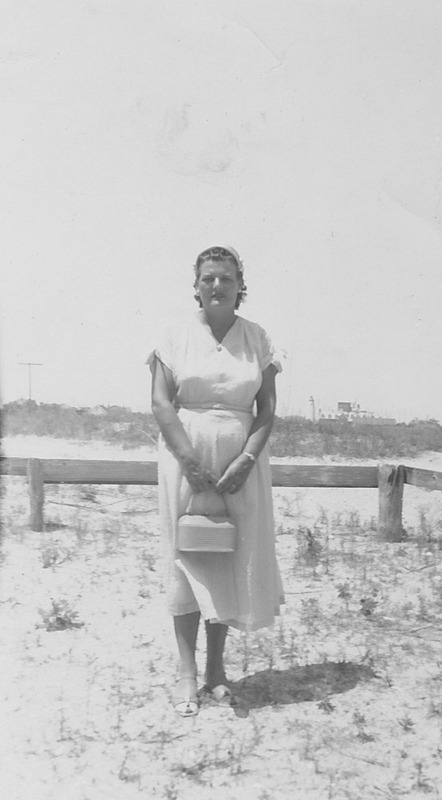 If you click on the photo and look carefully you can see the Ocracoke lighthouse and the Berkley Castle in the background just to the side of my mother's left elbow. This picture was taken in the front yard of the house I now live in, on Lawton Lane. I took the next photo of my daughter Amy standing in the same location. Unlike yesterday's photo of Howard Street that shows little change, it is remarkable how much vegetation has covered the village in the last 60 years! Today, trees and buildings make it almost impossible to see the lighthouse from most vantage points from as close as 100 yards. Not long ago I discovered a box of old photos. The writing on the back of this one confirmed my suspicions: "Grandpop Homer Howard" it read. I carried the photo to Blanche, thinking she may never have seen it. Immediately she said, "That's your grand-papa. I took that picture...right out in front of that tree where you have your signs." Blanche then continued to inform me that the photo was taken with her brand new Brownie camera which she had purchased for $2 in 1942. I asked Amy to take a photo of me standing in basically the same place. The tree is a little larger, of course, and my signs are attached, but other than that, Howard Street doesn't look much different. 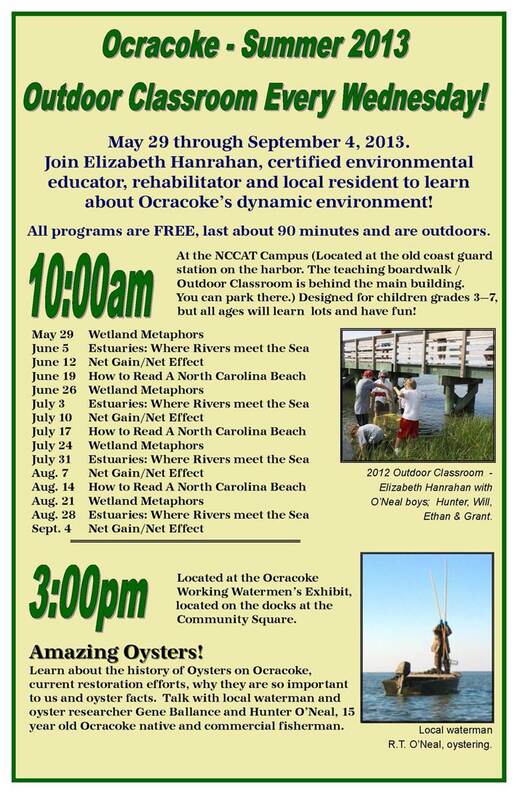 I know much more about Ocracoke than I do about the rest of the Outer Banks and "Down East" North Carolina. But recently I learned some interesting history of the Cape Lookout lighthouse. Although most lighthouse keepers were men, two women served at Cape Lookout. Second Assistant Keeper Charlotte Ann Mason Moore was appointed on August 21, 1872, and served until 1875. At the time, Charlotte Ann's father, Manaeu Mason, was the principal keeper, and B.P. Davis was the First Assistant. In 1876 Emily Julia Mason became Principal Keeper. She served until 1878. I don't know anything more about Charlotte and Emily Mason, though their responsibilities were identical to other keepers. Maybe our readers can direct us to sources of more information. Click here to learn more about the duties of a lighthouse keeper: http://villagecraftsmen.blogspot.com/2012/09/more-about-lighthouse-keepers.html. The Spanish Bayonet (Yucca Gloriosa) is a common evergreen shrub on Ocracoke. Several of these plants can be seen on Howard Street and vicinity. The dark green leaves are long, narrow, stiff, and very sharp at the point (hence the common name). Later in summer the Spanish Bayonet will send out, and straight up, one or more panicles (flower clusters) covered with bell shaped flowers. I will post a photo of the plant in bloom then.